The River Almond, once classified as the most polluted river of its size in the UK, has gradually been improving since the dark days of 1884, when angling on the River Almond had ceased completely. The River was at one point said to flow "nearly black at times and oil and particles of coal dust had been seen", but the creation of the Forth Purification Board saw the start of this improvement. Thanks mostly to the industries that relied upon its water falling into decline, the River Almond has improved vastly over the last 30 years. During this time one saving grace of the Almond has probably been the flush of the good quality water it receives from the Linhouse Water (A1 Excellent) and the Bog Burn (Murieston Water)(A2 Good)It should be noted that both the Linhouse and the Bog Burn have impassable blockages, the "Linn Jaw" a natural falls of 3 metres and on the later a disused weir (Grid Reference NT 043 621). There are still a huge number of obstacles and issues which need to be addressed, but hopefully this is something that will happen within my life time. Water quality is gradually improving, for example a further 7.2km was upgraded by SEPA from "Poor" to "Fair" during 2007. But improvements in the water quality have come at a cost, with the Almonds "Summer Level" constantly dropping, making the weirs and falls harder for the fish to pass. The River Almond starts its travels from the Cant Hills (B Fair), just North of Shotts, then winds its way North Easterly via Harthill, Whitburn and Blackburn(joined by the Cultrig Burn A2) to Seafield, where it is joined by the Breich Water(B Fair) (some say that the Almond should really be named the Breich), which is fed from the Gladsmuir Hills. The River then flows through the industrial new town of Livingston, via a number of weirs to Mid Calder, where the Linhouse Water joins at the westerly end of Almondell Country Park. The Weir below the Linhouse Junction is passable, a salmon pass was installed in 1978, but the biggest threat here is from poaching. The River continues on its journey through West Lothian into Midlothian and takes another tumble over the weir a Clifton Hall and at Kirkliston it is joined by the Brox Burn (C Poor, but I believe this has been reclassified in 2007). Then onto the Niddry Burn (B Fair)and the Swine Burn(recently upgrade from Poor to A2 Good), this is where the Cramond Angling Club's fishing starts. Then it rounds Edinburgh Airport to be joined by the Gogar Burn. The Gogar Burn starts life close to the A70, fed from the Corston Hill, making its way through West Lothian along the A71, where it's pure waters are very quickly polluted and to rub salt in her wounds, she runs under South Gyle and Edinburgh Airport via a culvert, before again seeing light just yards from its junction with the River Almond. Some stories I've heard tell how the Gogar Burn used to have a very prolific run of Sea Trout, but I'm saddened to say that I suspect these days are gone. A 10 minute walk downstream from the Gogar Junction Pool you walk under the Fife Railway line. The upper stretch is very open to the elements, with arable farming on both banks, before it enters the woods besides Craigiehall Barracks. The River takes on a completely different feel just above Craigiehall Bridge, where she tumbles through a gorge (see photo below). before displacing all her power and strength in the Grotto Pool, a huge pool and one I wouldn't like to guess the depth of! 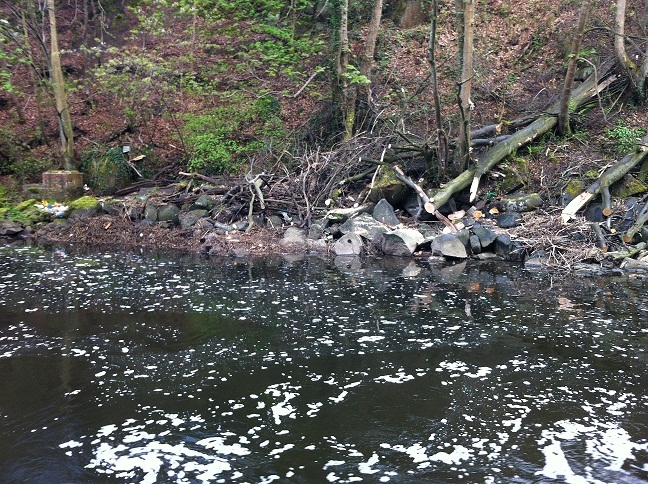 She flows onto the Cramond Brig and Dowies Mill Weir, washed away in the 80's and rebuilt in 1984 (why? ), with the most pathetic salmon pass in the world. 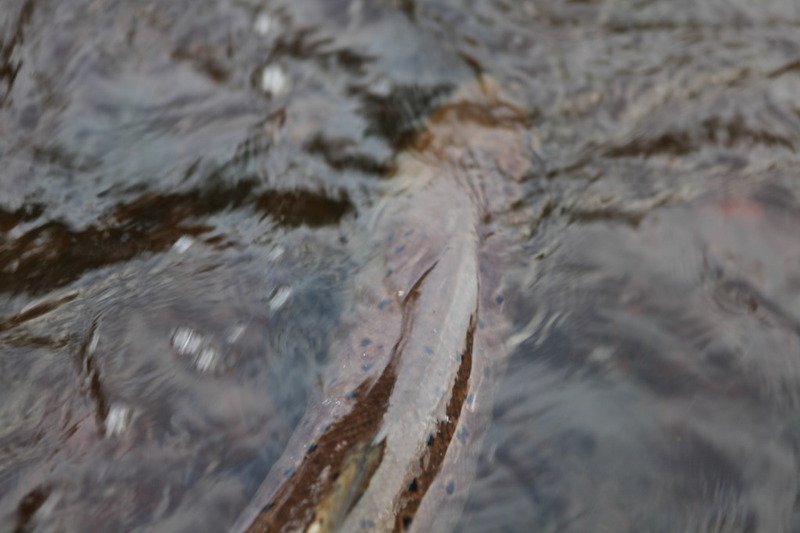 That said I doubt the salmon and sea trout ever have a need to use it! Finally the River enters the District of Cramond, where this old lady takes her final decent, a massive 10ft high weir known as the Waterfall which thankfully has a "passable" pass attached to it, then it's a short stroll to the tidal pool at the bottom of School Brae and into the Firth of Forth (For the record classified as B "Fair"). The estuary is flanked by Dalmeny Estate on the north bank and the white house's of Cramond Village on the south, very idyllic and picturesque. If you timed your walk right and you're a member of our Club, then you can always pop into the Cramond Boat Club for a light refreshment and mull over just how it is that despite the huge amount of damage man has done to this little River, Salmon and Sea Trout still return year after year. The Club formed on the 25th September 1963 like the River has prospered and declined over the years too, but thankfully at the time of writing (September 2009) the Club now has 240 members and hopefully they'll continue this little battle.